I have a fun tutorial for using our Printables! 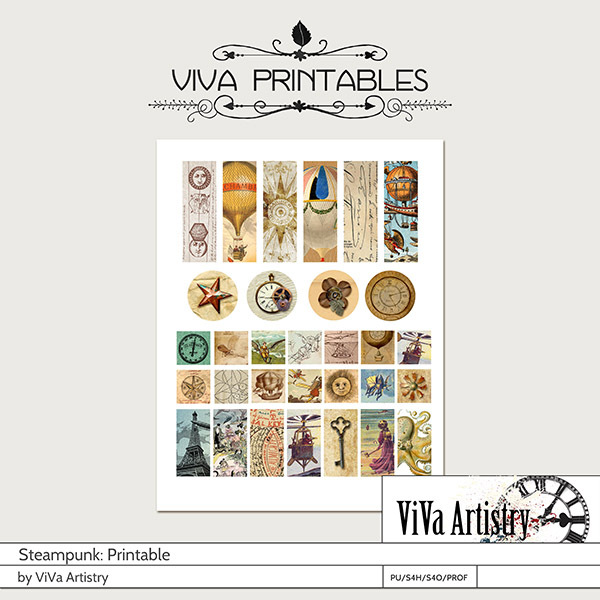 I made this cute little bracelet using the Steampunk Printable. We have a section in our store for printables. This is not only a great tutorial for yourself but for your teen this summer. It’s creative and it’s wearable! Most of the printables are made for collage work and not jewelry so the size may be an issue. I ended up printing this at 75%. You can either do the change in the printing prompts or create a new document in Photoshop, drag the jpg over and click EDIT>TRANSFORM>SCALE. Don’t forget to change both the height and width to 75% and save the new document as a jpg. You can print this out on your home computer. Since I don’t currently have one, I went to my local UPS store (or an Office Max) and printed on regular copy paper. I got most of my products at Hobby Lobby (it’s closer to my house than Michael’s) and I purchased the pendant bases and cabochons online. They are available together in a set on Etsy, Ebay, and Amazon. I couldn’t find the cabochons at either Hobby Lobby or Michael’s. I have seen this with adhesive already on the back of the cabochon which would make it super easy. Using the clear cabochon, select the image you wish to use and cut it out to fit into the pendant base. Use the E-6000 glue (with either a toothpick or Q-tip) and adhere the image to the base. Take the clear cabochon and adhere over the image with the glue as well. I used a brush to put the glue on as its quite thick. E-6000 is a strong adhesive but it will take up to 72 hours to cure and dry properly. It does dry clear. I use it a lot for mixed materials use. If you don’t want to use cabochons, you can use Modge Podge Dimensional Magic (I found it at Hobby Lobby). Just pour the liquid over the image adhered to the base and let it settle. Try not to get bubbles into it. Also, don’t shake the bottle as bubbles will form. The difference is that the cabochon sticks out of the base and has a globe like finish. The Modge Podge will dry flat into the base. Take a jump ring, spread it open with the pliers (I use a plier in each hand) and put the pendant on it. Before closing the ring, put it on the chain. Do this with all the pendants as well as whatever additional charms and beads you wish. Put a larger jump ring on the end so that the closure will work. And that’s it! Great new bracelet that is uniquely YOU!